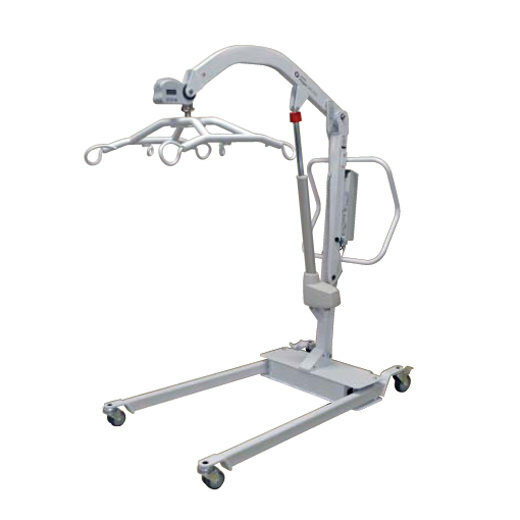 Click here for more sling options..
Hoyer classic bariatric lift with digital scale is a uniquely designed electronically operated patient lift or the safe lifting of heavier patients. It is both sturdy and robust with a safe working load rating of 700 lbs. Classic bariatric lift is compatible with multiple spreader bars, allows caregivers to use one lift for clients considered bariatric and non-bariatric alike. It has been designed to be configured with a seamlessly integrated weigh scale that has a two-sided digital display and user-friendly controls. Classic lift is also equipped with unique Hoyer Smart Monitor technology that accurately records and displays vital lift utilization and service data to help improve safety for both clients and caregivers, facilitate the lift’s maintenance, and optimize the product’s lifetime. The digital scale allows the caregiver to adjust the position of the display for easier viewing. Simple, intuitive controls provide the resident’s weight in pounds or kilograms. Compatible with multiple spreader bars increases the versatility allows caregivers to make the best choice for the client. Proprietary technology that features a programmable control box that accurately records and displays vital lift utilization and service data. Height at maximum reach 46.5"
Maximum reach (Center of spreader bar to the front of the mast) 37.75"
Overall height of legs 4.5"
Mast and boom (not included battery) 40.4 lbs. Note: Please note the following sling guides are recommendations only. A full risk assessment must be conducted before any sling is selected. This will ensure safety for the resident and the caregiver. The warranty does not include damage caused by use in unsuitable environmental conditions or failure to maintain the product in accordance with user and service instructions. Any alteration, modification, or repair unless performed by or authorized in writing by the manufacturer will void the warranty.